As a multi-year San Diego Zoo member and mom of two animal-loving children, I have spent A LOT of time at this world-renowned zoo. 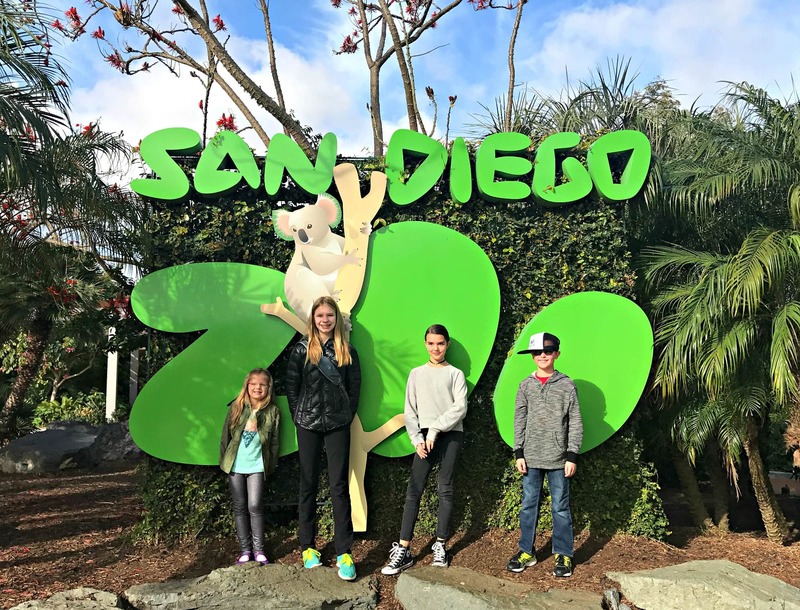 I know which animals children love to see, the best places to eat, and the special extras that make San Diego Zoo with kids memorable. This zoo is huge so you probably won’t be able to see all of it in one day. 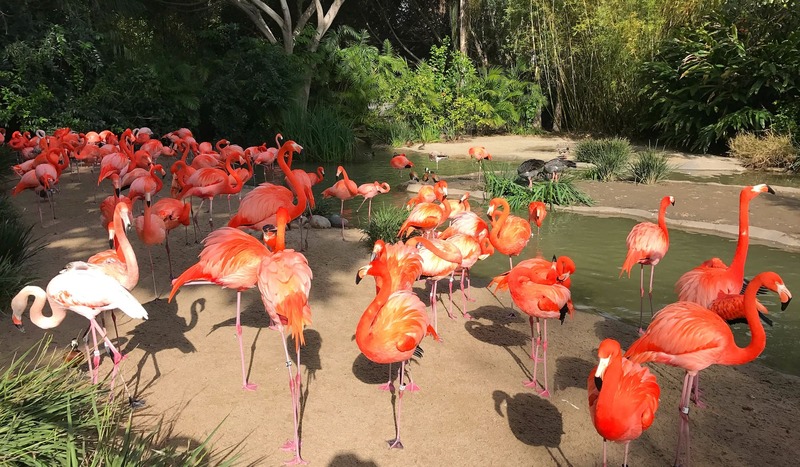 Use my tips and suggested San Diego Zoo itinerary to help you make the most of your visit. 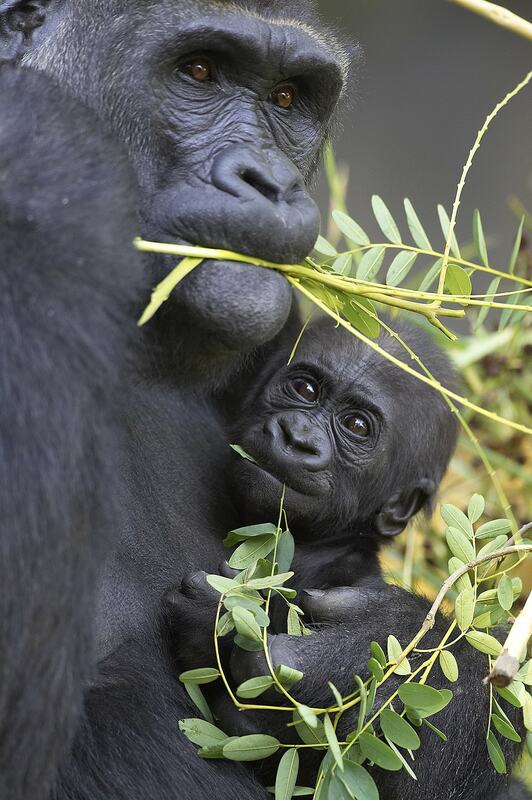 Find San Diego Zoo sales and deals including ticket discounts and hotel package discounts! If you want to see most of the zoo (about 75 percent) during a short timeframe, cough up a few extra bucks for the bus tour. You will view a multitude of animals with the added benefit of the driver’s educational commentary. Plus, most kids love sitting on the top level of the double-decker bus. If you have a child age 3 or younger, though, I suggest skipping it. The tour takes 35+ minutes and you’ll spend most of your time placating your little one rather than enjoying the ride. Imitate the flamingos standing on one leg and “quack” at the ducks at this pond. This is an easy exhibit to work into your schedule since it’d located near the zoo’s entrance. Even though you will see many more exotic animals at this zoo, these birds are always a favorite, especially for toddlers and preschoolers. Otters are typically some of the most active and playful zoo residents. Children just love to watch otters climb, dive, slide and swim. You can view a Cape clawless otter along Center Street as well as spotted-neck otters in Lost Forest. Children giggle with delight when watching San Diego Zoo’s flock of flightless African penguins waddle and play. Plan to spend a lot of time at this exhibit. 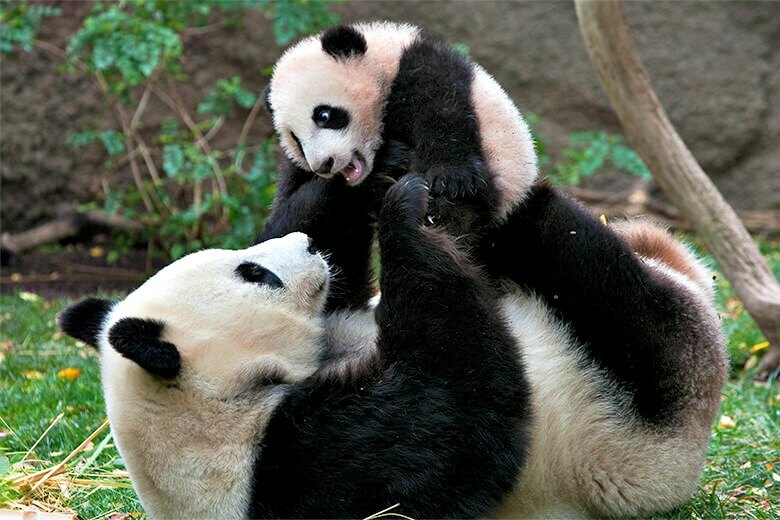 San Diego Zoo’s most popular residents are its pandas. On busy summer weekends you may have to wait in a long line to see the Oreo-colored bears. If you’ve visited San Diego Zoo in the past, take note that the pandas have moved from Panda Canyon to Bear Canyon, closer to the entrance. Upon entering the zoo, take a right along Front Street and then take a left onto Center Street before Sydney’s Cafe Street to access Bear Canyon. View the live Panda Cam. This lush exhibit is overflowing with waterfalls and greenery. Get a sense of just how big these apes are by placing your hands in gorilla-cast imprints. Kids love climbing on the life-sized sculptures of the gorillas. Be careful, though, the bronze statues can get hot in summer. Elephant Odyssey is definitely worth seeing when visiting the San Diego Zoo with children. Learn about the world’s largest land animals and their prehistoric relatives, the mastodons, while wandering past live Indian and African elephants. You will also see camels, jaguars, and lions, among other animals in this area of the zoo. 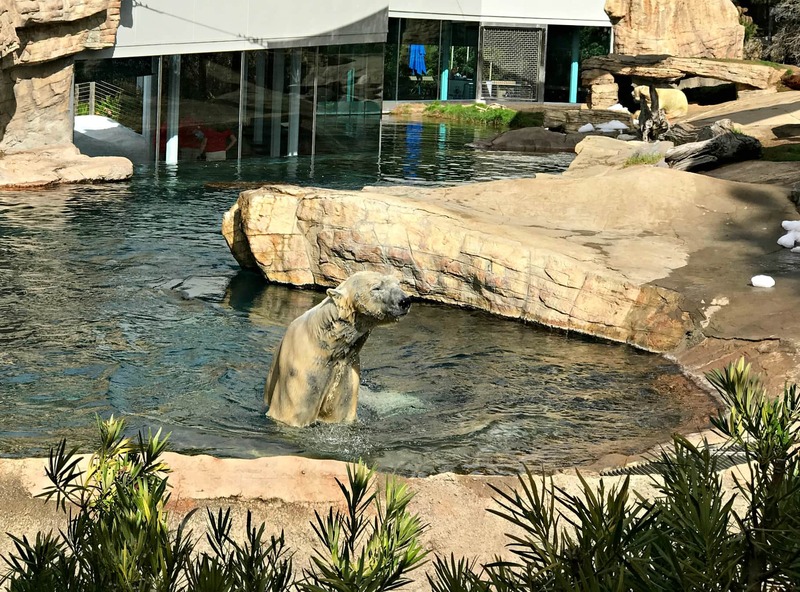 If you’re lucky, you might see a polar bear going for a swim and splashing about at Polar Bear Plunge during your family’s visit to the San Diego Zoo. You can view this massive mammal from an underwater viewing area or from above. The educational displays here show children how much polar bears need to eat each day (a lot!). There’s also a crawl-through polar bear cave made of faux plastic ice. Board SkyFari near the Children’s Zoo in Discovery Outpost or near Polar Bear Plunge in Northern Frontier. The ride will send your family soaring above the treetops for a birds-eye view of the animals below. It’s also a handy way to get from one side of the zoo to the other. There is an additional fee to ride this attraction but San Diego Zoo members ride for free. If you’re visiting during the summer or on a weekend, check the schedule for giraffe-feeding times. Your kids won’t soon forget handing treats to these sweet, towering animals. A visit to the cuddly koalas is probably a necessity, especially if you’re visiting with an elementary-school-aged girl. Don’t expect a lot of action, though. Koalas are sleepy creatures so most likely you will find them taking a nap. Take a peek at nearby adorable creatures like wallabies and tree kangaroos in Outback while you’re there. The Discovery Playground provides a great place to let kids run around and get their wiggles out. It features a twisty slide and climbing equipment. Beware that toddler feet will likely get caught in the rubber climbing netting. While in Discovery Outpost, stop by the Petting Paddock to get up-close to goats, sheep, pigs and other farm animals. Check the daily schedule for animal encounters in this children’s zoo area. For surprisingly good lattes and other coffee drinks plus baked goods, check out Jungle Java in Lost Forest near the zoo’s entrance. Meanwhile, Sabertooth Grill is one of the best eateries in the park. Most zoo food comes deep-fried and tastes like, well, zoo food. You can, however, find healthy, tasty options like wraps and salads at this restaurant. Plus, their soups are especially delicious. 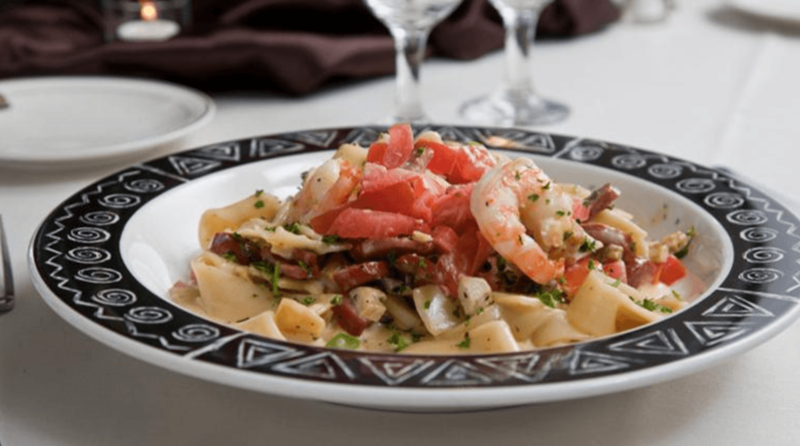 If you’d like to indulge in a sit-down meal with table service at San Diego Zoo, you can! Make reservations in advance or pop into Albert’s along the Monkey Trail. The food is good, the setting is lovely and there are some decent wines on the menu. But, I personally would rather spend my time exploring the zoo than eating a lengthy meal. Kids meals are available at restaurants throughout the zoo. Expect standards like chicken strips, hot dogs, or quesadillas, depending on the restaurant. Outside food and drinks besides baby food are not allowed, but San Diego Zoo is pretty lenient when it comes to packing children’s snacks. Since the zoo is located within the beautiful Balboa Park, you could easily bring a cooler filled with food to keep in your (rental) car. Get your hand stamped to enjoy a meal at a picnic table in the park and reenter once bellies are full. A miniature train located just outside the zoo’s entrance typically runs every day during the summer and spring break, but only on weekends off-season. If sharing a train with a gaggle of school-age children, beware that field-tripping kids scream in unison through the tunnel. It’s best to wait for the next train. Balboa Park Carousel, built in 1910, is one of the few carousels in the world that still offers the brass ring game. Big kids and adults who want to play should choose an outside horse. Then reach out to grasp the small rings on each spin. Iron rings don’t count; only the rider who nabs the brass ring wins a free ride. This itinerary does not cover every single animal at the San Diego Zoo. It’s a big zoo, after all. But it does include the highlights with options for shortening or lengthening your visit to suit your family’s needs. When arriving early in the day, stop by Jungle Java near the entrance to get your caffeine jolt to help you tackle the zoo. Then head to Center Street (a.k.a. Bear Canyon) where you can spy on bears of all sorts, including San Diego Zoo’s famous pandas. It’s smart to head here early in the day before lines for panda viewing get too long. 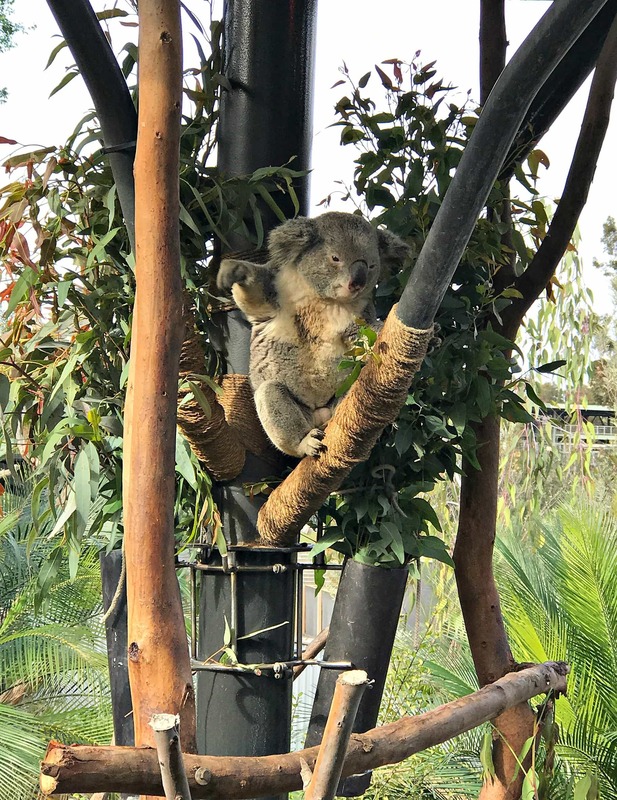 An optional add-on is to make your rounds through Outback to view koalas and other adorable animals from Down Under before hitting up Center Street. If you’re hungry, stop for some Asian lunch at Hua Mei Cafe, named for the zoo’s matriarch resident panda. Otherwise, wait to eat at Sabertooth Grill near Elephant Odyssey, my pick for the best food at San Diego Zoo. To get there, walk through a portion of Africa Rocks, and spy on playful African penguins along the way. After lunch, head up through Elephant Odyssey to view the pachyderms and learn about their ancestors. You’ll see big cats like lions before reaching Northern Frontier, where polar bears are the star. 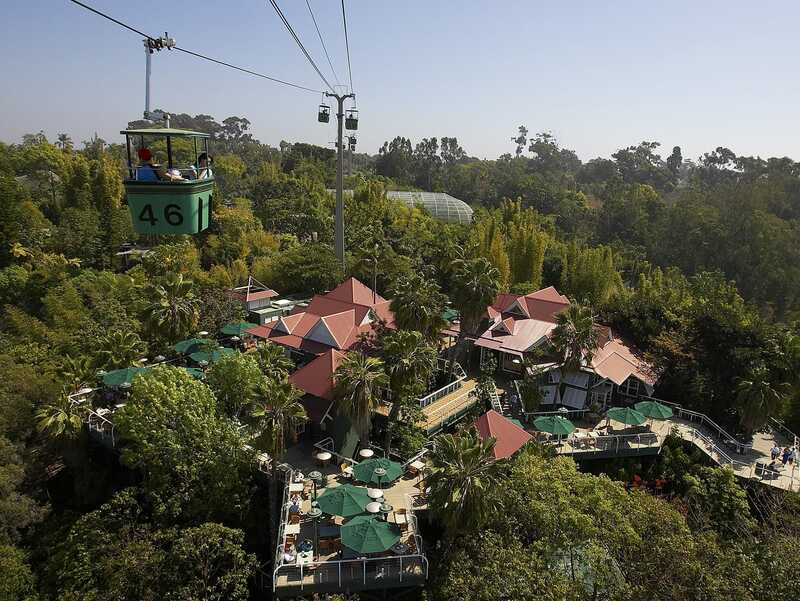 Next, board Skyfari West for an uplifting way to view the zoo and reach Discovery Outpost. If you’d rather walk, take the bridge across the former Panda Canyon. Then wind your way through the Monkey Trails. If taking this route, make sure to stop by the gorgeous gorilla exhibit. In Discovery Outpost, pet the farm animals in the Petting Paddock. Then rest your feet while children explore the Discovery Playground. Lastly, hit up the Flamingo and Duck Pond before you head out, if you did not already see this exhibit at the end of your Monkey Trails tour. 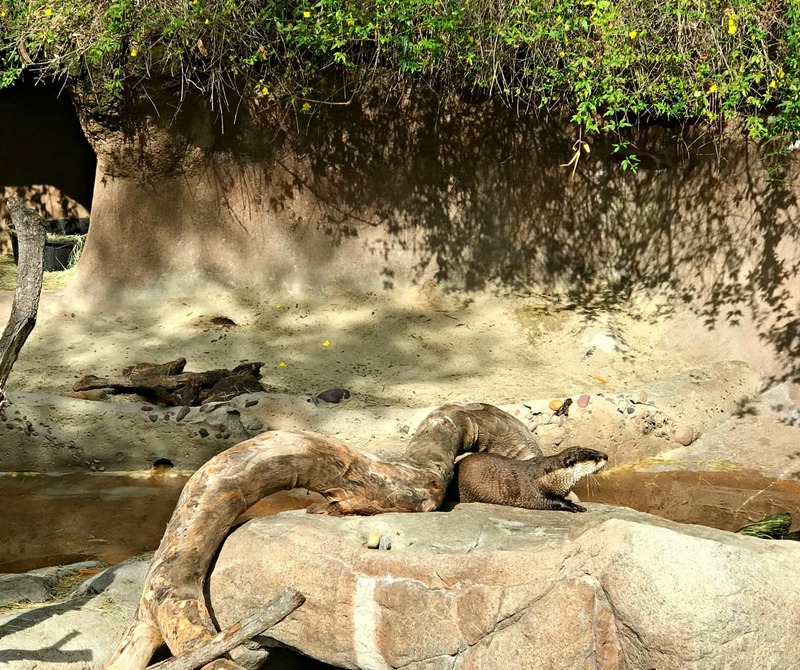 If you’re feeling very ambitious, you could try to squeeze in additional Africa Rocks exhibits, the Lost Forest with its Tiger Trail and Hippo Trail, or the giant tortoises and Reptile House located outside the children’s zoo area of Discovery Outpost. To watch any of the zoo’s animal shows and demonstrations, you may need to modify your itinerary somewhat. View a San Diego zoo map here to find locations and plan your day. 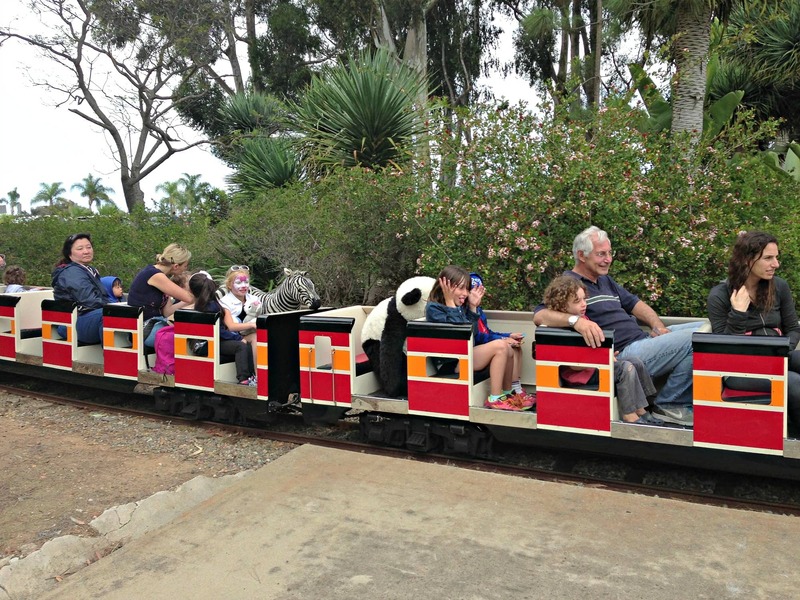 After exiting San Diego Zoo, round out your day with a ride on the Balboa Park Railroad and a spin on the Balboa Park Carousel. 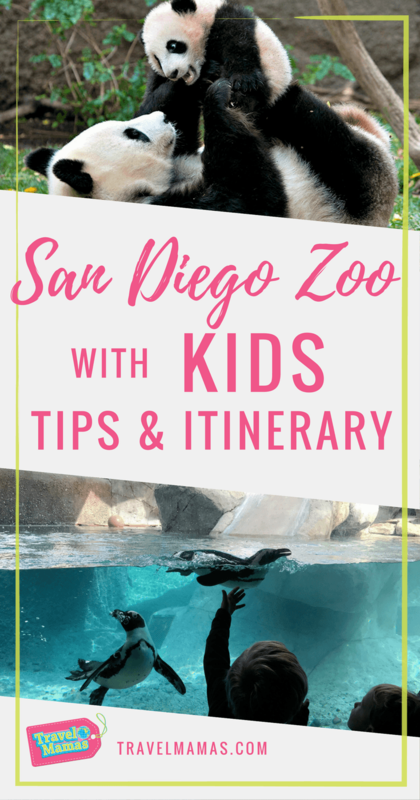 If you want to follow this itinerary, I suggest printing it before you go, or pulling it up to follow once you’re in the San Diego Zoo! San Diego Zoo is just one of many incredible things to do in San Diego. Read our picks for the top 15 San Diego attractions for kids. (Can you guess where the zoo ranks?) Save up to 55% on over 40 of San Diego’s best attractions, like the San Diego Zoo, with a Go San Diego Card. 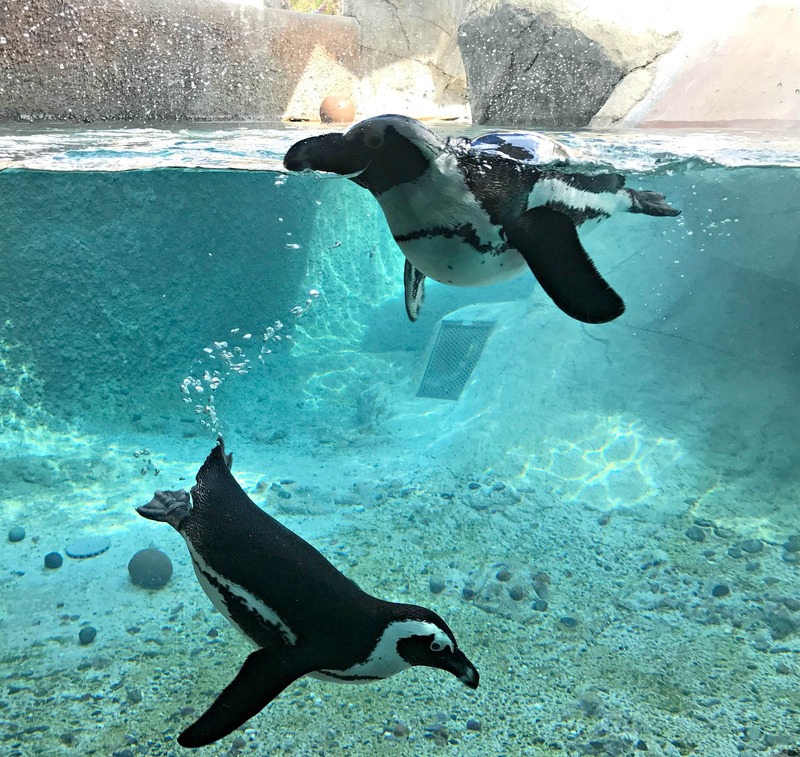 Find additional San Diego Zoo sales and deals including ticket discounts and hotel package discounts from Travel Mamas’ partner, Get Away Today. Do you have a favorite exhibit or activity at San Diego Zoo? 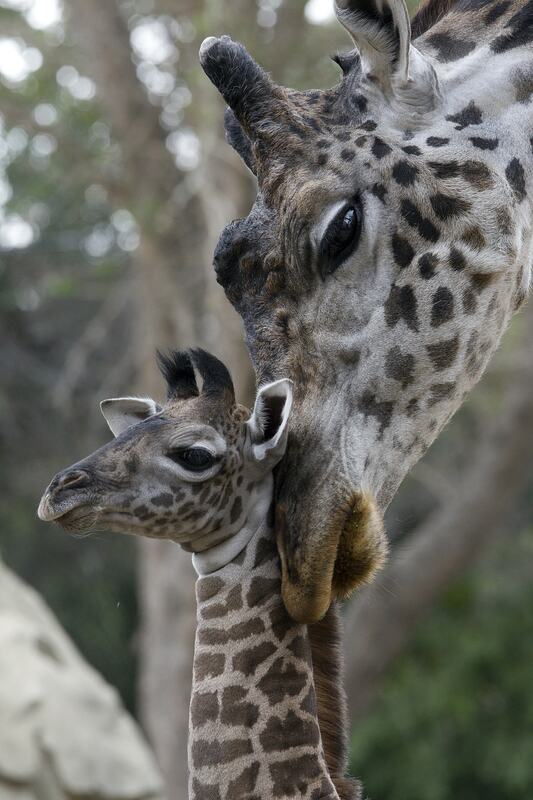 Or do you have any questions about visiting San Diego Zoo with kids? Let us know in the comments below! A Note from The Travel Mama: I did not receive any compensation related to this story. All opinions are mine, as always. This story originally went live in 2009 and was updated in 2017 to reflect changes in the zoo’s offerings and exhibits. Great article! I will bookmark it as well for future trip planning ideas! Great post Colleen. We have not taken all four of our kiddos to the zoo. Now seems like the perfect time while they are free in October. Thanks for all of the great ideas. I will be sure to print and take with me so as not to forget a single thing. Will you have a post on the wild animal park too??? Great post! Also, if people are from the LA area or somewhere within a couple hours drive SD Zoo’s membership is STILL worth it to get. If you are going more than once and also vositin the Wild Animal Park, its a great bargain. And you get zoonooz which is my 2 yr olds favorite. :). Elephant odessey is my FAVORITE restaurant now. Ever since it opened– great seating area too. I like how its kinda coralled too so your kiddos can have a lil bit of freedom. Thank you everyone for your great comments and tips! Kelly – I do plan to do a post on the San Diego Wild Animal Park’s Roar N’ Snore Sleepovers soon! We love the San Diego Zoo too! Isn’t is great? You’re spot-on, too, with these must-see exhibits. How lucky that you got to see the panda AWAKE, by the way; whenever we go, and stand on line for a peek, it’s naptime for the pandas. Great idea to include a map of the Zoo since it is so large. The additional links to the pandas and elephants makes the article really dynamic. Thanks for the information. We are planning a trip to San Diego from Seattle with our daughter, 10, and looking for ideas on how to make the most of one day at the San Diego Zoo. Do you have a “best suggested route” through the zoo to see the best exhibits? -If you don’t mind walking a lot & you have time, you can do the former & then walk over to Children’s Zoo & take the Skyfari to polar bears before walking back to entrance through the other side of Lost Forest to see hippos & tigers. Of course, if you don’t want to walk that much, you could always take the Bus Tour & then just select which animals you’d like to see up close afterwards. I hope that helps! Please write after your visit & let me know how you liked visiting “my” zoo! Thank you for the valuable website. We will be taking our two grandchildren to the zoo this summer. They do get fidgety (ages 4 and 6) I noticed a face painter in the entry.. and they would probably like that and the play structure as much as anything. Do you know if the face painter is there every day? I loved hearing what you thought was the best.. We have season passes so will check it out before the grandchildren arrive in July. Hi Maxine – Truthfully, we have never done the face-painting at the zoo but I do believe this is something that is always offered. Enjoy your time at the zoo with your grandchildren & thanks for your comment! What do you think of the Express Bus to see certain animals.. Is it easy to get off and on or is there a lot of waiting.. We waited quite a while to go on the guided Bus tour and wondered if the Express Bus would be easier.. Also, We loved the commentary on the double decker bus but did not see as many animals as we thought we would … not sure if it would appeal to very young children. Hi Maxine – We rode the guided bus tour when my kids were aged 2 and 5 (or so) but they were to young to enjoy it and got very fidgety – especially the little one. Now that they are older (5 & 8), they have been saying they’d like to go on the bus tour so I think we’ll give it another go. I agree with you that you don’t see the animals very up-close on the bus tour. 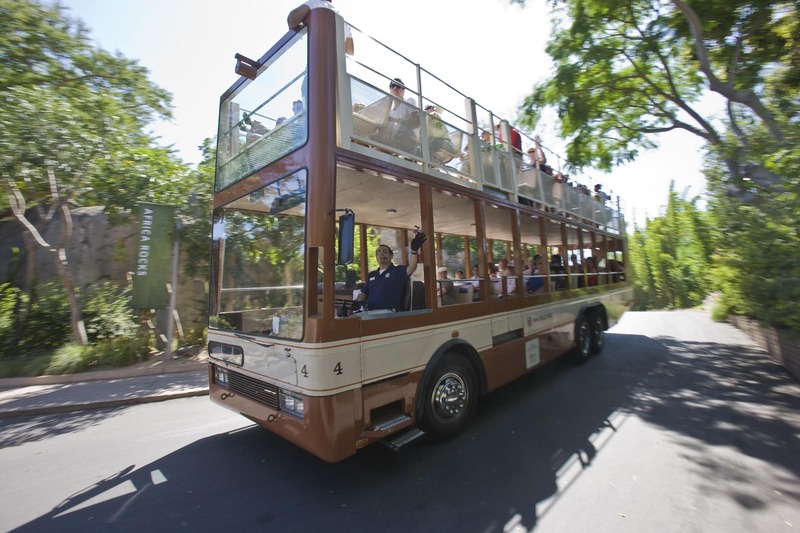 The African Tram Safari ride at the San Diego Zoo Safari Park might be a better option for younger kids (but, again, the tour lasts longer than my kids’ limited attention spans). With your zoo bus tour ticket you get the added bonus of using the Express Bus, which can be helpful if you want to cut down on walking, walking, walking all day! Thanks for such a great post! We are planning a trip in October with our 5 children. The youngest will be a year and a half so a stroller is a must. Do you know if they allow strollers on the skyfari? Amy – As long as you can fold up your stroller, you are welcome to bring it on the Skyfari with you. Enjoy your San Diego Zoo visit! 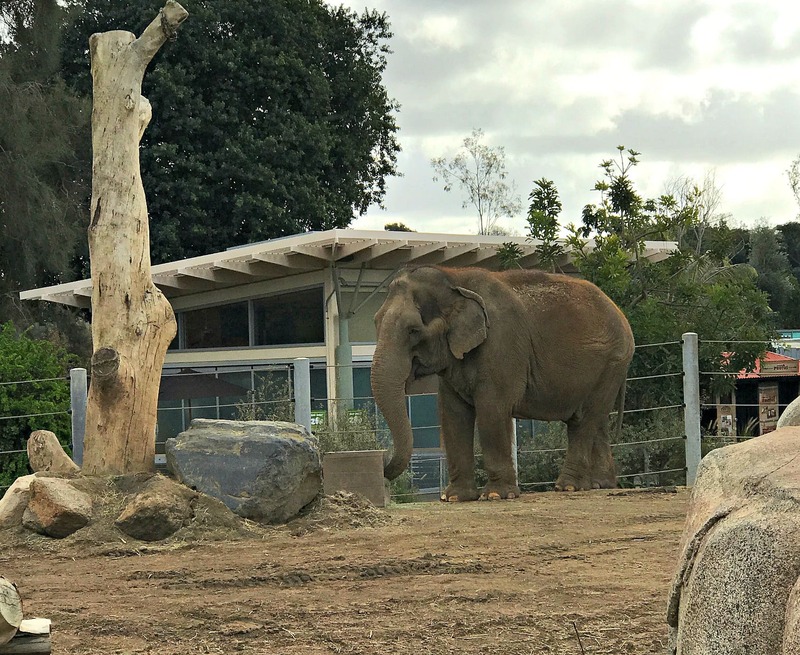 Mary – You and your granddaughters will love the San Diego Zoo! I updated the map link above to show the most recent zoo map. Printing out the map might help. Click “Download” next to the word “Map” at the top. Then print the page by clicking the printer image at the bottom right of the page. Hope that helps! Thanks to giving a very nice information about a san diego zoo,that helps to when going with kids..If you are giving a map of this zoo,so its better for me..
Hi Angel – there is a link to the zoo map in the first paragraph. Hope that helps! I am planning on going there with my 3 year old son. Do you recommend to stay at a nearby hotel? Please advice of great hotels nearby. Hi Edgar – Paradise Point is a great resort nearby. It feels like a slice of Hawaii in SoCal. 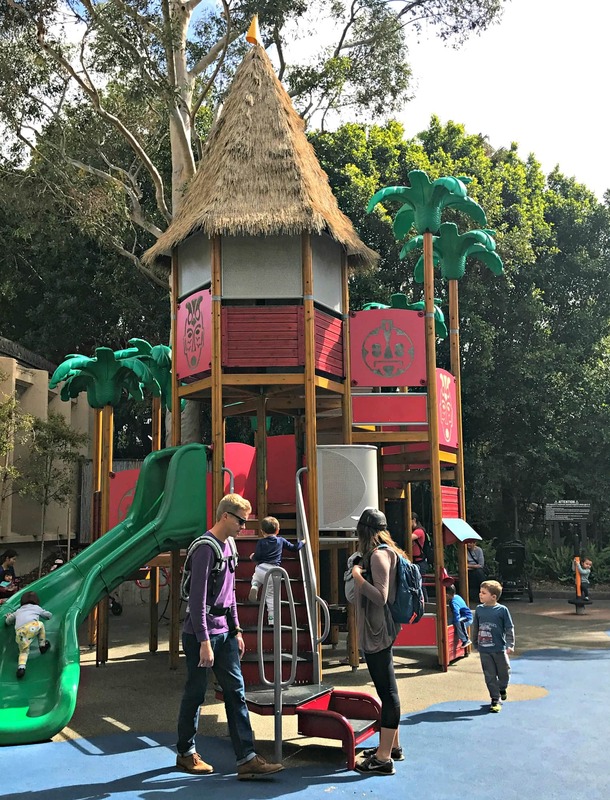 Here’s my review: https://travelmamas.com/san-diego-paradise-point-resort-with-kids/. Also fairly close is the Hilton San Diego – where I got married 15 years ago! Here’s a review by a Travel Mamas contributor: https://travelmamas.com/hilton-san-diego-resort-spa-review-a-great-home-base-for-exploring-san-diego/ If you are looking for budget accommodations, there are lots of motels, hotels and resorts in the Mission Valley area of San Diego. Many hotels provide free transportation to/from the zoo but you will probably want to rent a car for your San Diego vacation. Enjoy! Wondering if you think toddlers have the attention span to do the Early Morning with the Pandas tour? We will have three-18 month year olds and a 4 year old in our group. We love the idea of the tour because it begins at 8:30am, which lets us maximize our morning at the zoo until nap time. Hi Katie – I haven’t personally done that tour. I see that it is 2 hours long, which might be a bit much with so many littles. It does sound interesting with the upclose animal encounters, though! If you are visiting in summer, especially on weekends, the line to see the pandas can be quite long. However, if you arrive right as the zoo opens and go straight for the pandas (going down Bear Canyon is the most direct route), you should not have to wait. I was just at the San Diego Zoo last week and was surprised to find there was zero line to see the pandas around 11 am, but February is off-season. Also, the pandas typically just lay there sleeping, so they’re not the most interactive animals at the zoo. Since they will be eating during the Early Morning with the Pandas tour, that might be more exciting. It’s really up to you to decide if you’re group will be able to handle a 2-hour tour! Either way, enjoy your San Diego Zoo visit! The San Diego Zoo is an amazing place. We visited when we were in the area a couple of years ago, and it was one of the best zoos we’ve ever been to. My family is so lucky to have visited the San Diego Zoo so many times. We enjoy every visit! I’m from California and never went to the San Diego Zoo! I wish I had when I lived there, though, because these pictures make me wanna go now! Oh my, Jeni! You must visit the zoo the next time you’re in SoCal! I have not been to the San Diego zoo since I was a kid. Back then it was gorgeous I am sure it is even more gorgeous now. I would love to be able take my kiddos there and explore that zoo again. I like everything that you had mentioned here. These tips definitely are helpful. Glad you find the tips helpful, Jeanette! I love how San Diego Zoo gives their animals such expansive and nature-filled homes. Now that we live in Arizona, we are planning on taking a trip to San Diego with our twins. The zoo is definitely on our itinerary! I’m bookmarking this because I know it will be a great resource when we go! Thanks! I live in Arizona now, too, Lisa! San Diego is such an easy and fun destination for us Zonies. Enjoy your SoCal vacay! My kids absolutely adore the zoo. This looks like such a great place to take them. So much to do and see! Almost too much! You could definitely spend two days exploring the San Diego Zoo if your kids really love animals. The penguins are so playful and fun to watch! What a beautiful zoo! Our local zoo is small and does not have too many animals. I would love to visit this zoo, I have heard great things about it in the past. This zoo really did spoil me for other zoos! Still, I enjoy smaller zoos where the focus is on conservation. This is one of our favorite zoo’s too! My kids had a blast here last time we were there! It’s so fun AND educational! What a great day! I still remember visiting the San Diego Zoo as a kid. I’d love to take my kids someday! I hope you can, Randi. I’m sure your family would love San Diego Zoo! The zoo is such a fun way to spend a day with the family. Ending your visit with a ride in the mini train and carousel sounds perfect! I would love to visit the San Diego Zoo! It looks like there are so many fun activities to do there as well as view and learn about the animals. Those flamingos are SO vibrant! It’s so funny how the ducks and flamingos are so beloved by young zoo visitors! This is so much beautiful. I can feel that you had awesome adventure! We’ve been to the San Diego Zoo countless times and always enjoy ourselves! I haven’t been to a zoo in ages. The San Diego Zoo will be awesome to see. My favorite animals are the tigers. The tigers can be elusive but they’re so fun when they decide to make an appearance! Great post, Colleen! The Skyfari ride and the bus tour were the most memorable parts of our trip to the zoo. I would recommend going for multiple days or just ride the bus if you don’t have the time or multiple days don’t fit in the budget. We only saw part of the zoo and our little one was exhausted and fell asleep. The zoo is massive, many times larger than any other zoo we’ve visited so keep that in mind. Good advice! San Diego Zoo can be overwhelming to first-time visitors, especially if they think they’re going to see EVERYTHING in one visit!